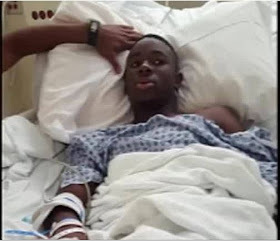 Rueben Nsemoh, 16, shocked family members and doctors when he opened his eyes after a three-day coma and began uttering sentences in Spanish, despite having known only a few words before his accident. Another teenager accidentally kicked Rueben on the right side of his head during a game on Sept. 24 after Rueben dove for a loose ball, he said. Rueben, an aspiring professional soccer player, suffered a severe concussion, went into shock and had to be airlifted to a hospital, according to his mother, Dorah Nsemoh. Days after being treated in the intensive care unit, Rueben finally started stirring again. He began moving his hand and gesturing for food. And then he blurted out: “Tengo hambre,” or “I am hungry” in Spanish. Nsemoh then ran out of the room to find help and brought back a nurse. “A nurse asked me what language does he speak. I said, ‘I speak English. He speaks English. We’re not Spanish-based people,’” Nsemoh said. That case was diagnosed as foreign accent syndrome, a very rare condition in which people speak with a different accent, usually after head trauma or stroke, according to CNN. Severe cases of Traumatic Brain Injury (TBI) and concussions can also cause changes in language function, according to the Centers for Disease Control and Prevention. Rueben says he could recite just a few phrases in Spanish before his accident. The only ways he had heard Spanish were from his brother, who had previously studied in Spain, and his Spanish-speaking teammates. In the weeks after the accident, Rueben gradually recovered the ability to speak English, and now he speaks both languages fluently, although he says the Spanish has begun to fade. Doctors say Rueben’s brain scans suggest he will fully heal, but the family has been overwhelmed by mounting medical bills in the $250,000 range, Nsemoh said. A GoFundMe page for Rueben has collected more than $11,000 to go toward the teen’s medical costs.